Fell running in the Peak District isn’t always about blue skies & sunshine. 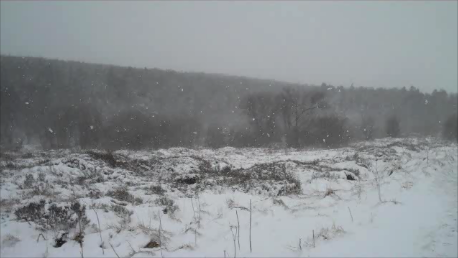 Today the wind howled, snow blew horizontally and the world was reduced to cold shades of grey. This was no day to be out on the high fells, even at low level the wind’s icy fingers found their way through the smallest chink in my armour of windproof clothing, feeling for, finding then chilling any exposed skin. Facing the wind, big damp gobs of snow numbed my face and drove into my eyes. 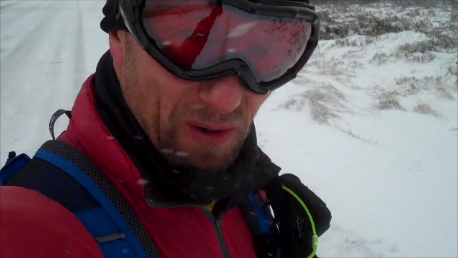 Last week I learned a hard lesson when in even worse conditions on a remote hillside I had wished for my ski goggles lying unused back home. Today I had anticipated the worst and packed them and it didn’t take long, running semi blind into the fusillade, before I stopped to put them on. Other than the blowing wind, running conditions weren’t too bad. It seemed that my route, exposed as it was, wasn’t producing those horrible, energy sapping drifts where you disappear up to your knees (and beyond), rather it was scouring the ground leaving a thin compacted layer. 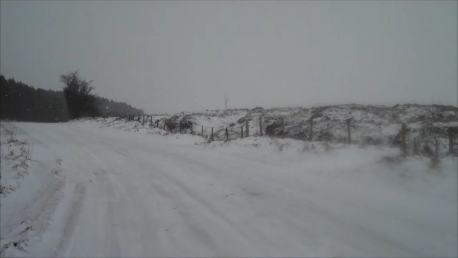 I had chosen a short tour of Burbage, using the snow covered Ringinglow road for the last 2 kilometres. Here the few vehicles that had passed had compacted the snow into a thin icy layer and I stopped to don microspikes over my Mudclaws. Once down towards Lady Canning’s plantation the trees afforded some protection although large flakes still sped horizontally past – whirling away in their own mad dash, racing each other into oblivion – as I ran down the road. 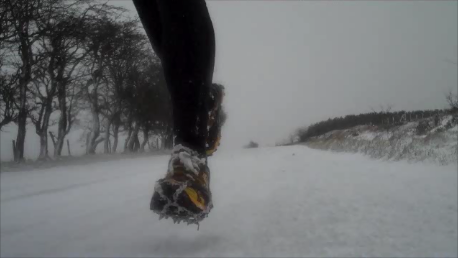 Posted in Blog, Equipment, Fell running, Peak District and tagged ice, inov-8 mudclaw, Kahtoola Microspikes, snow, video, winter. Looks a bit fresh up there. Just wondering, what size of mudclaws do you use? I am looking to get some spikes for the next winter for size 10 mudclaws, but 10 happens to be between the M and L for the spikes, so any insight on the fit would be appreciated. Hi. I have size 6.5 Mudclaws and small Microspikes which I think fit up to size 7. If you are also going to use them with others shoes such as walking boots consider their size too. Take your Mudclaws etc along and wear them to try on with the Microspikes.